Ruby and Sarah here! 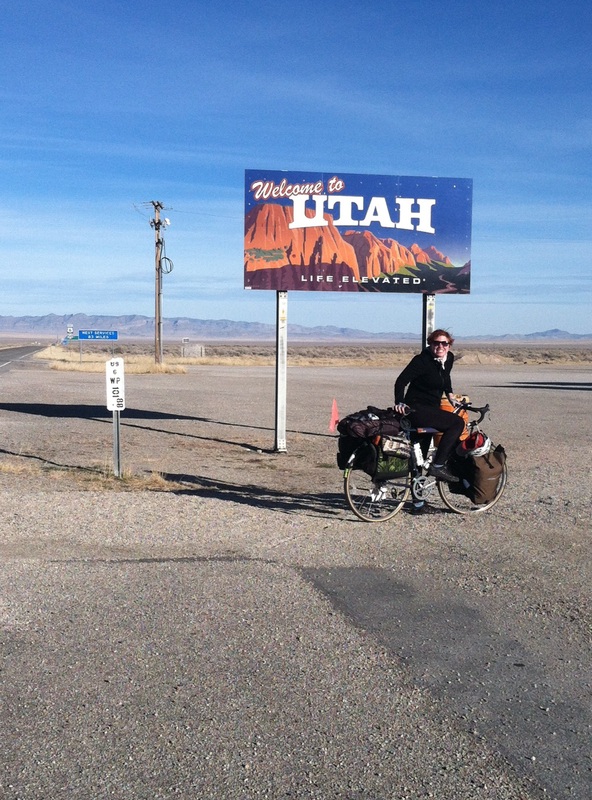 Proud to say that we have officially made it to our third state- Utah! This is the first bike tour either of us have ever done, and we are finally starting to adjust (both bodily and mentally) to this new physical lifestyle. 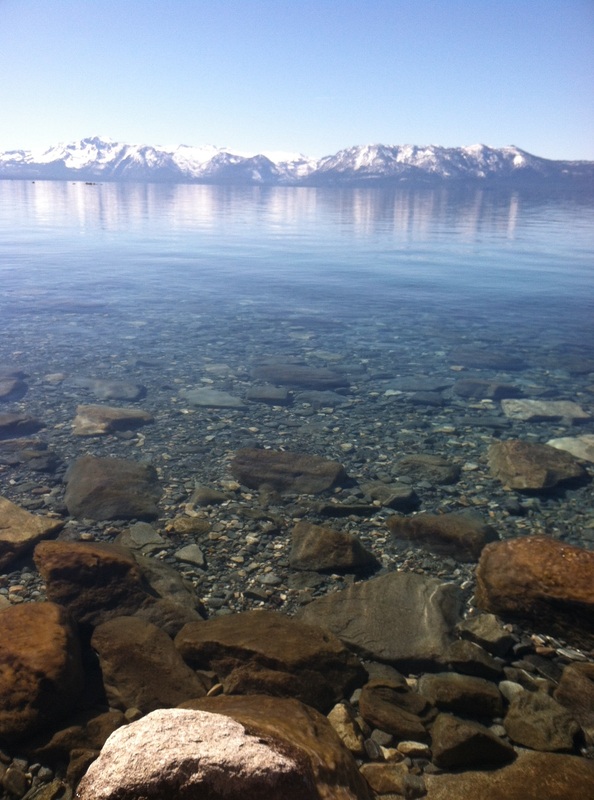 After leaving the sunny state of California and beautiful, mystical Lake Tahoe, we began our journey across route 50 in Nevada, known as ” The Loneliest Road in America.” Nevada was beautiful in its own way, and very difficult to traverse by bicycle. There are often 60-70 miles between towns, with no services or even places to refill water from one town to the next. Also, the mountain ranges run north to south, so between towns we also had to cross 2-4 mountain ranges a day. The ascents were brutal, steep climbs for 5-15 miles, followed by thrilling and terrifying descents at up to 30 mph, flying down into the basin only to climb up the next range. 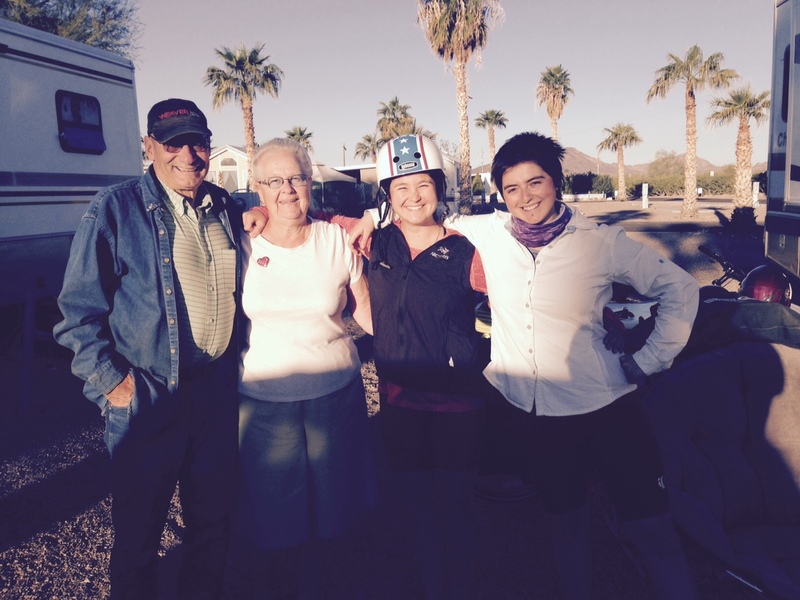 In addition to the fact that we were both still green to the physical challenges of bike touring, we both got visited by “Aunt Flo” in Nevada (to use my favorite period euphemism). We mused a lot about the impact of our menstruation on our physical performance, whether it was a hindrance or not, and what the spiritual significance might be of emptying a menstrual cup on the side of the road in a barren desert. I will say that we felt incredibly grateful for menstrual cups, because having to change tampons or pads in this type of environment would have been pretty inconvenient and gross (where would we dispose of them?) not to mention quite uncomfortable for biking such long distances. While the populations in Nevada were sparse and we had very few interactions with other women, we did have a few impromptu discussions along the way about alternative menstrual products. We visited with a friend in Fallon, NV who is in the US Navy, and we talked about how menstrual cups could be a total game changer for women in the service who are deployed on ships or in other conditions where it is not convenient to carry a load of period supplies or dispose of used ones. We also stumbled upon a big St. Patrick’s Day party in Border, NV where we country-danced with a bunch of real-life cowboys and had some quiet little girl-talk side conversations with some of the women there (most of whom were young mothers) about the harmful chemicals in pads and tampons, and how much money they could save by switching to reusables. We were delighted that they were very curious and open to it! The awesome flyer for our SLC event in collaboration with Moontime Rising! We finally made it to Salt Lake City yesterday, where we will be taking a few rest days before our BIG EVENT on Saturday! We are thrilled to be collaborating with Giuliana Serena of Moontime Rising, a local menstruation expert and guru, who will be opening the workshop with a talk on the history of menstruation! 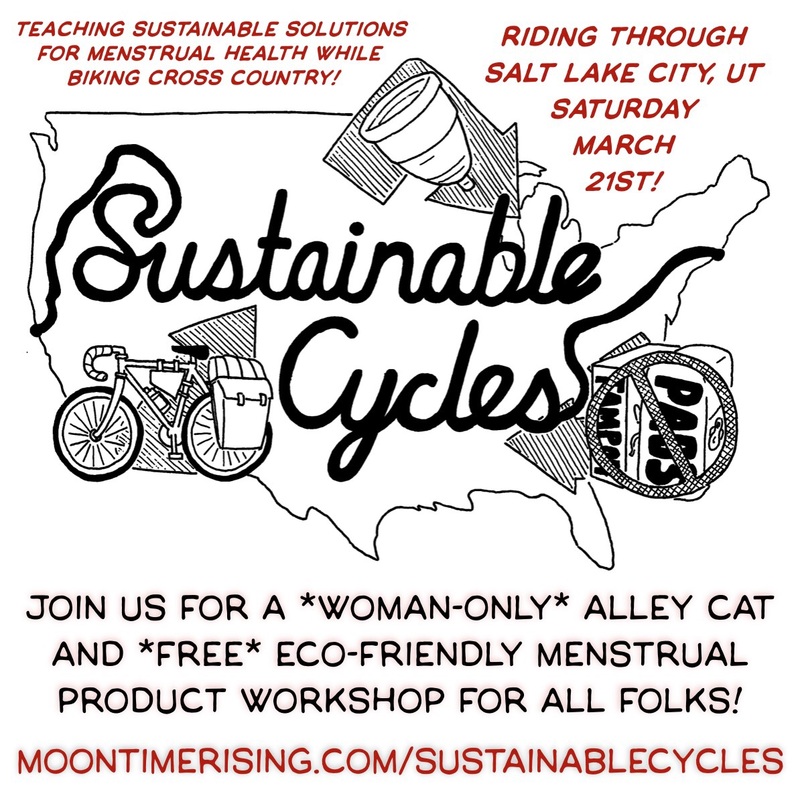 The SLC Bicycle Collective has also organized an all-women alleycat race during the day to lead in to the event! Tell your Utah friends, this event is going to be our biggest yet! 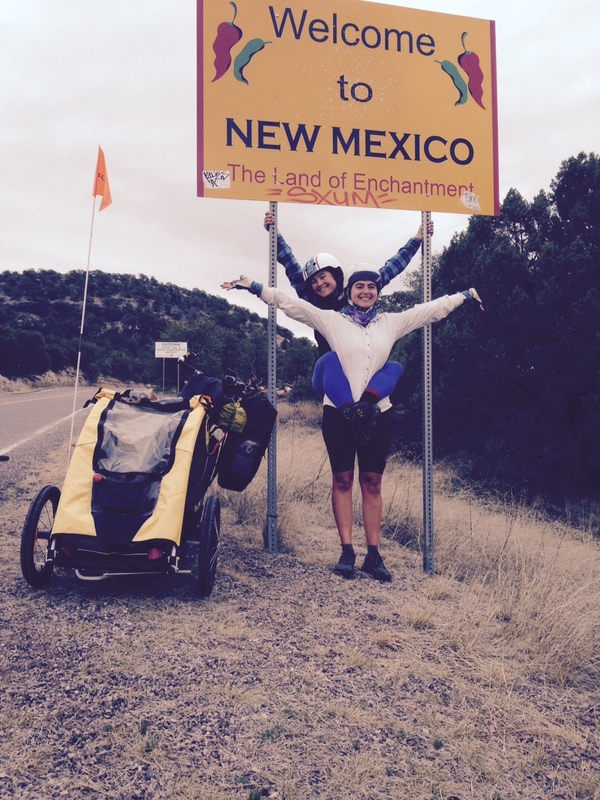 Ruby and Sarah are almost through their first state! Ruby and Sarah are rocking through Cali! 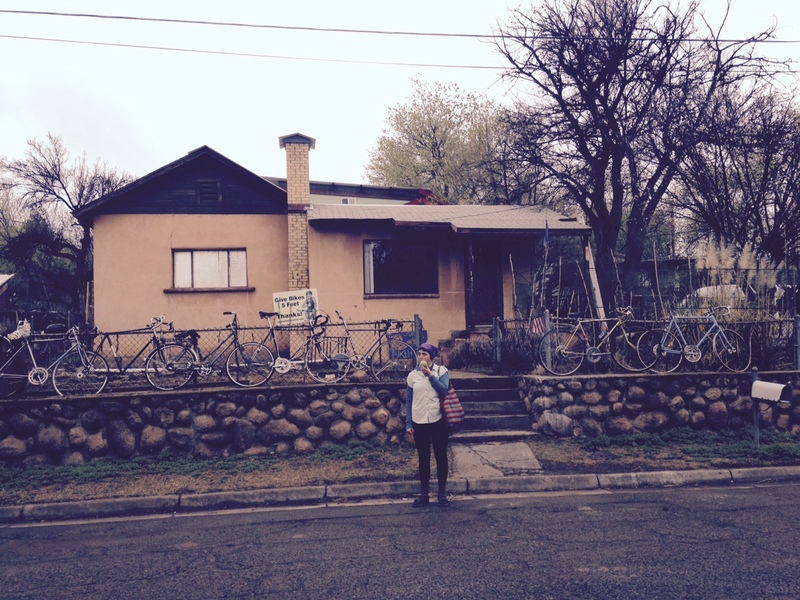 We started by picking up our bikes at the Oakland Amtrak and staying with some fantastic hosts at an Oakland co-op. They had a beautiful garden and fed us well, and took some information about sustainable menstrual products. 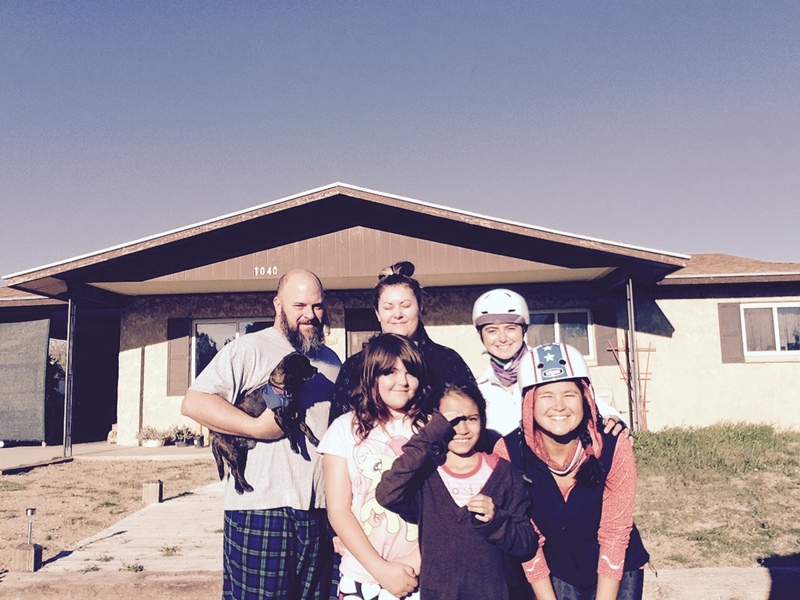 Our hosts in San Francisco had a chicken coop and made us homemade eggs. The hills were killer, but we were able to make some good connections and purchase last minute gear at our Sports Basement event. The next day we took the Vallejo ferry and headed to Lake Solano outside of Davis for the most beautiful biking we have ever done. We rode through rolling green pastures and wine country, and got up to 27mph on some of the downhills! We camped at a park overnight and woke up to dozens of peacocks! 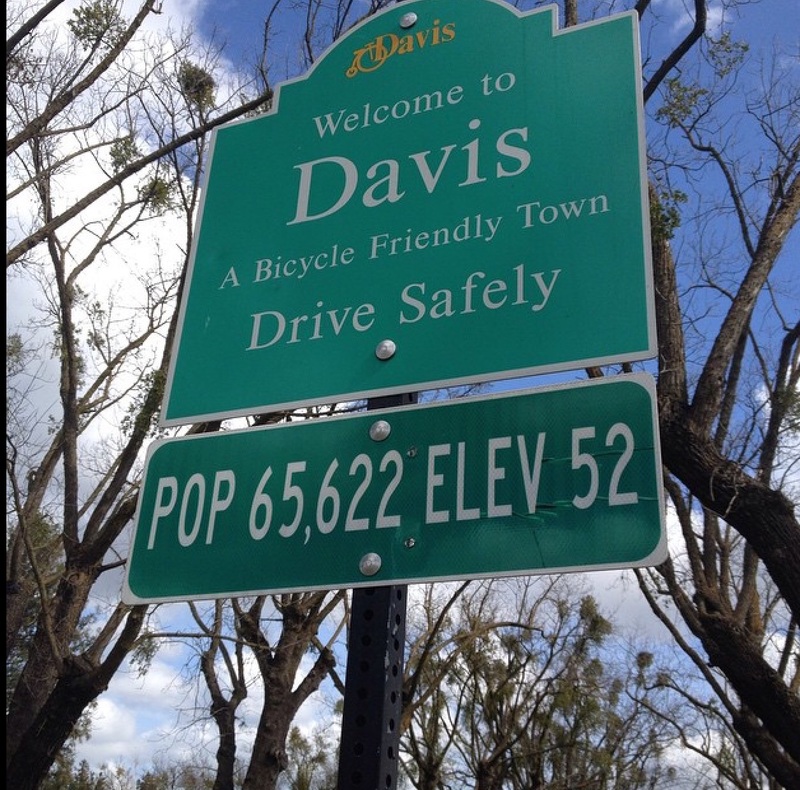 In Davis we had a successful event at the US Bicycle Hall of Fame. We met five amazing women, and we were able to check out the “history of the bicycle” exhibit! We saw a 6 person tandem, and a few seriously old “penny farthing” big wheels. 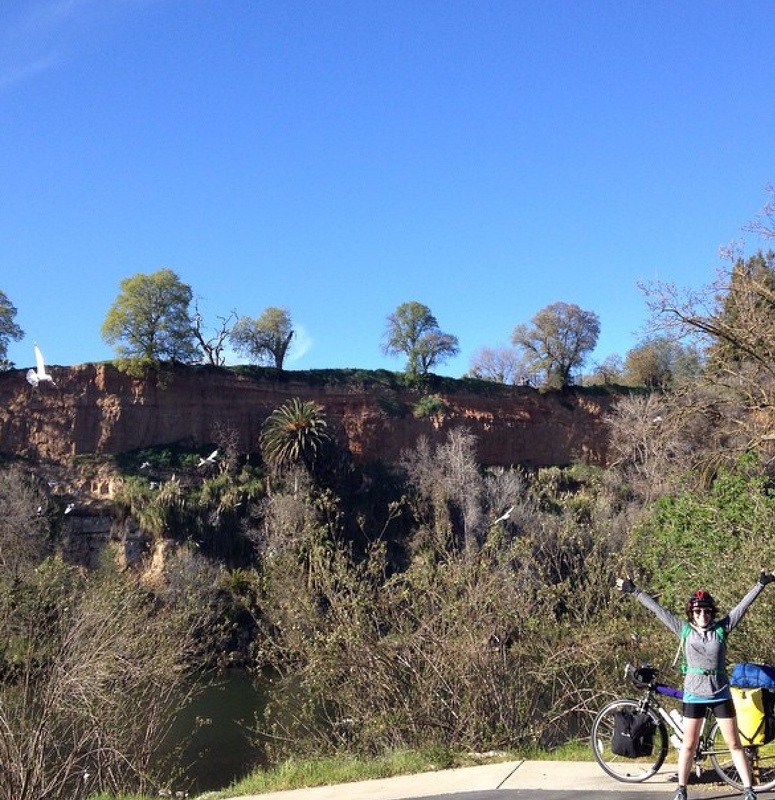 The next day we passed through Sacramento on the American River Bike Trail, which was amazingly beautiful and scenic! We then made our way to Folsom, and YES there is a Johnny Cash memorial there. 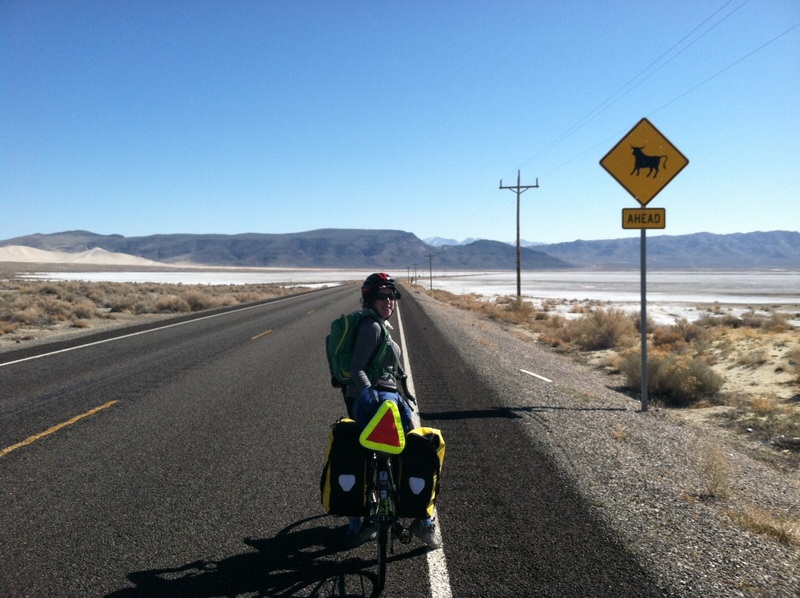 Our host had cycled 11,000 milast year and helped us plan our next few days through Carson Pass and into Nevada. 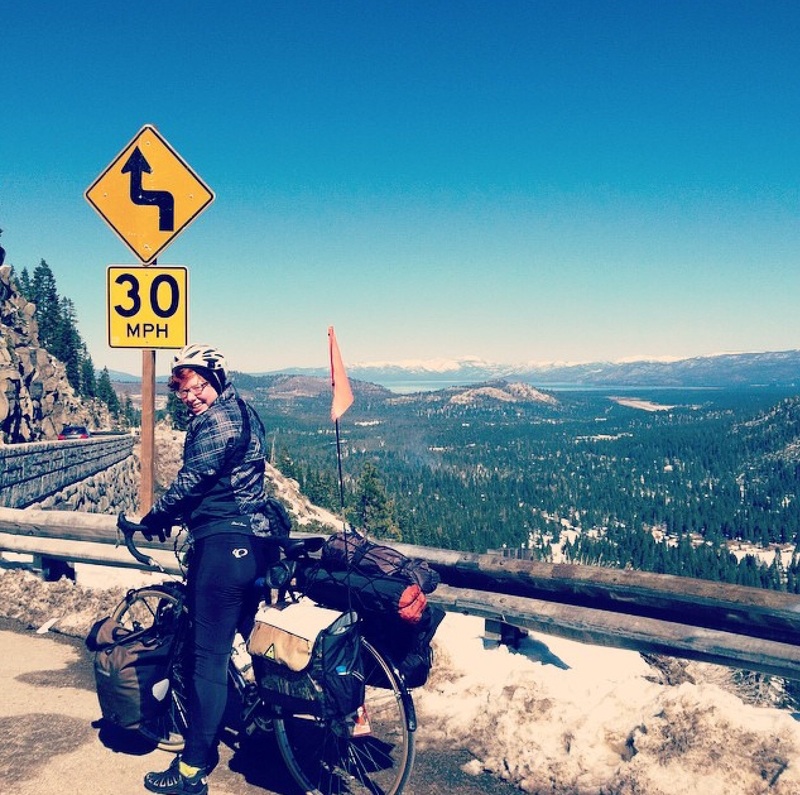 He even offered to drive us up the steepest mountains of the Sierras, which he said were some “real superhero climbs even without a fully loaded bike.” He dropped us off at the top of Echo Summit, and we rode four miles downhill into Tahoe. So far we are blown away by hospitality, and willingness to discuss reusable menstrual options. 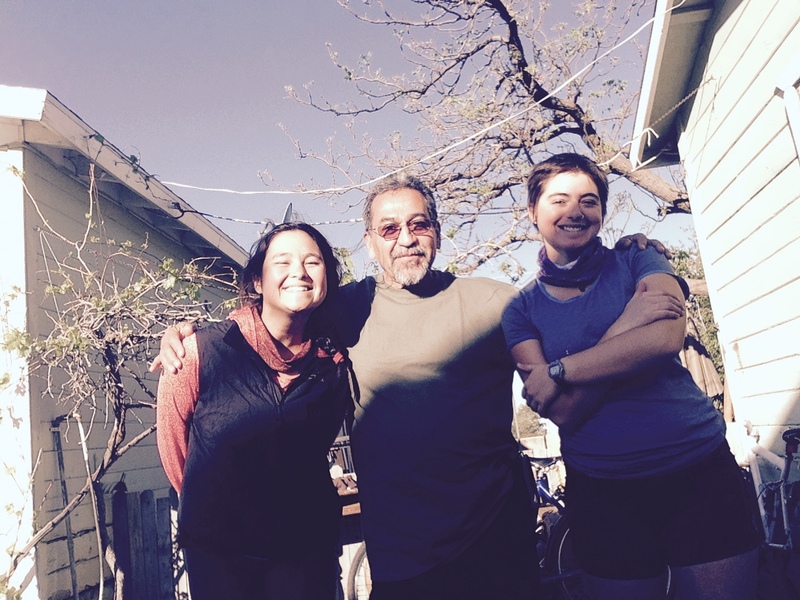 Tomorrow we will decend into Carson City and stay with a host with a young daughter who loves when women cyclists visit. Us too! WE DID IT! 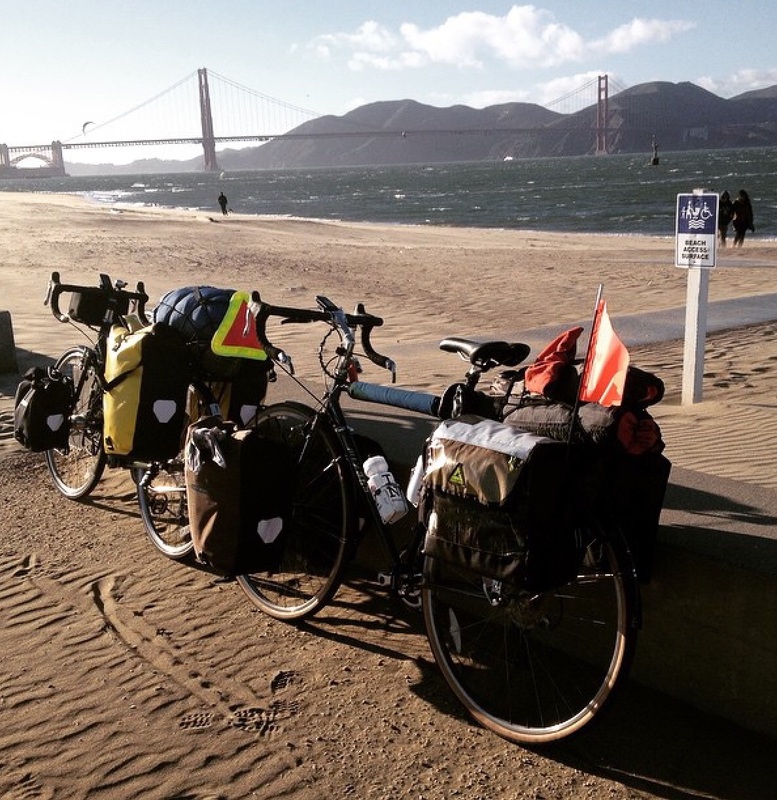 2015 Will be our largest bicycle tour yet! Major thanks to all of the 200+ wonderful people who donated to our Indiegogo campaign! 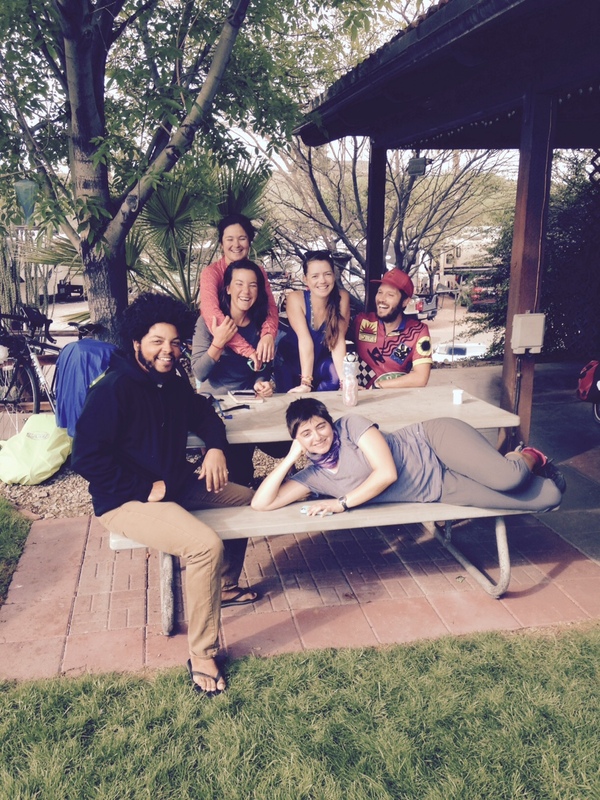 We surpassed our goal of $10,000, and our seven riders will be embarking on their journeys in the next few weeks! We are so grateful for your love and support, and are so excited to start this adventure! 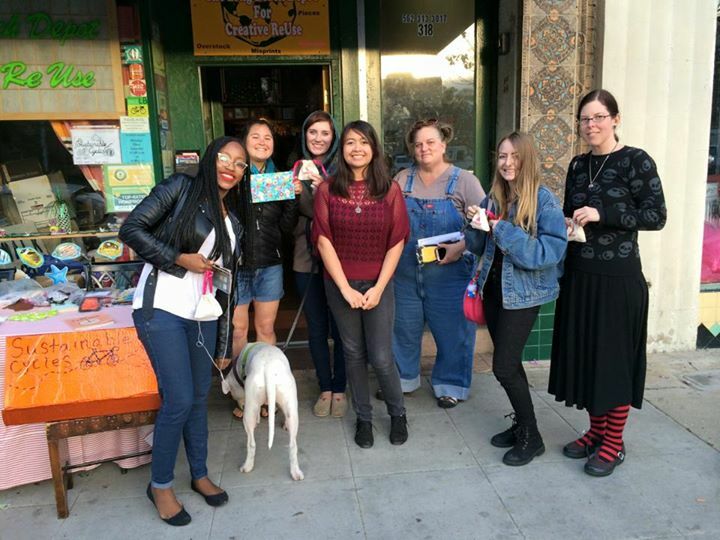 Thanks to our sponsors, DIVA CUP, LUNETTE, THE KEEPER, MY OWN CUP, RUBY CUP, PARTY IN MY PANTS, COZY FOLK, THINX, JUJU, AND GLAD RAGS, for donating the samples that are making these workshops across the nation possible! We would also like to thank Vaya Bags, Green Guru, DeFeet, Bicycle Habitat NYC, and WEBike NYC for providing our riders with some snazzy gear that we can’t wait to use! 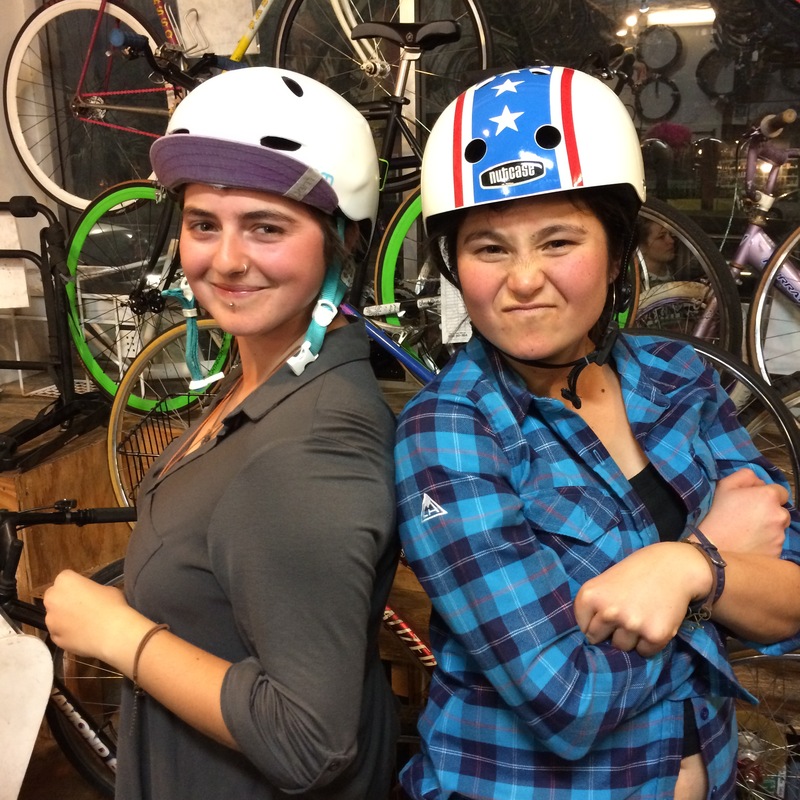 Rachel H and Olive will be starting in Los Angeles on March 2 and biking across the southern tier, joining up with Rosie in Austin, TX. 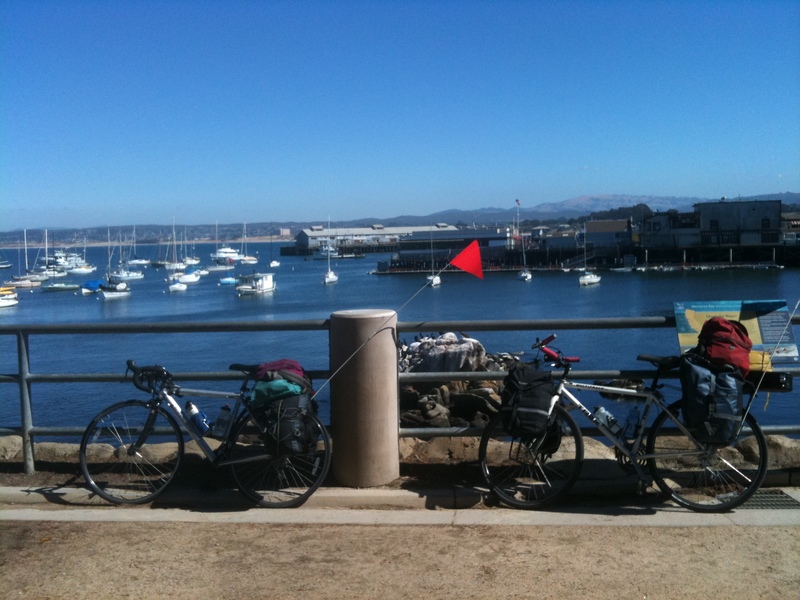 Ruby and Sarah will begin their tour in the Bay Area on February 26, and will bike across the Midwest. 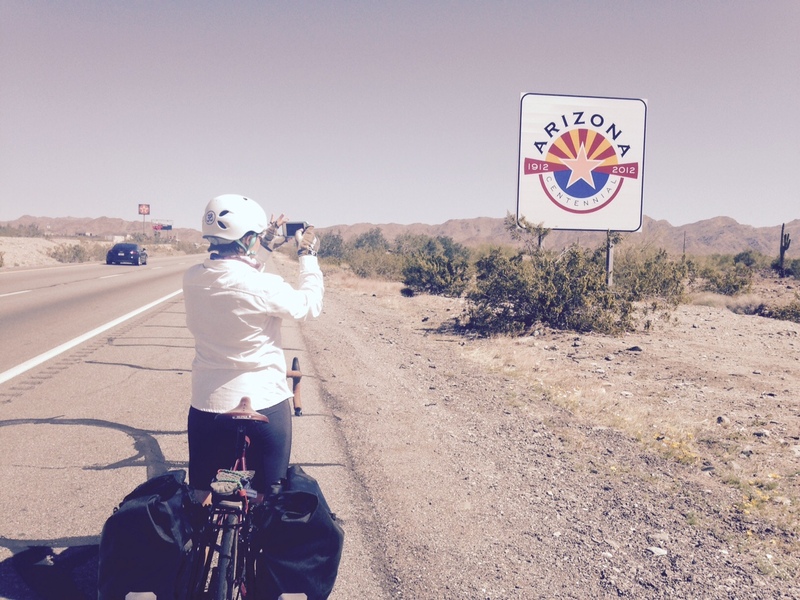 Rachel S and Heather will be biking up the east coast from Key West, Florida. 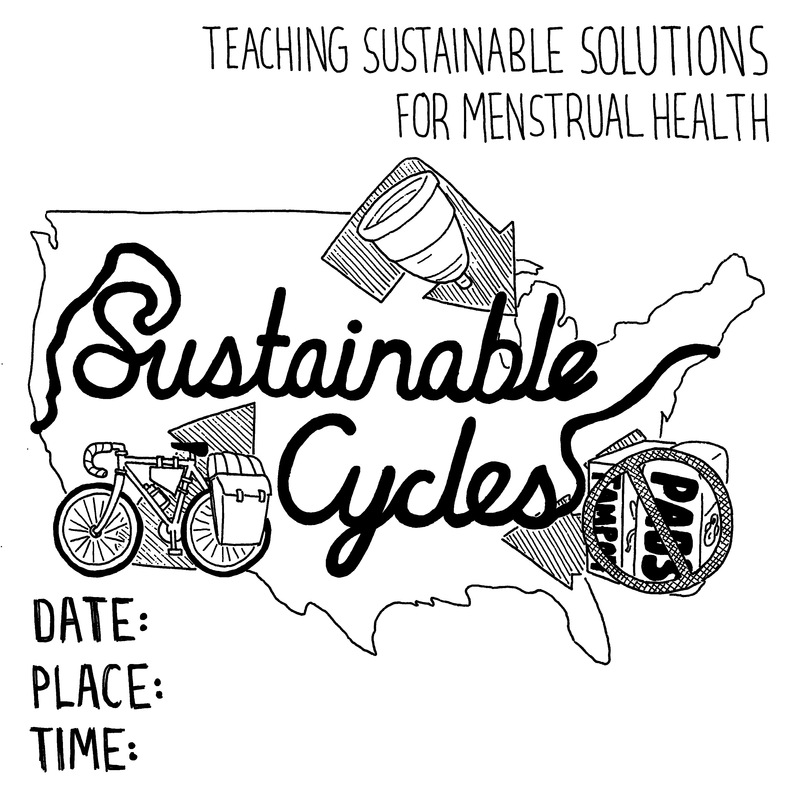 All seven riders will converge in Richmond, VA on May 14, and bike in a group up to Boston for the Society for Menstrual Cycle Research conference on June 4th. We are gearing up, and we are thrilled to know that we have the love and support of all of you! 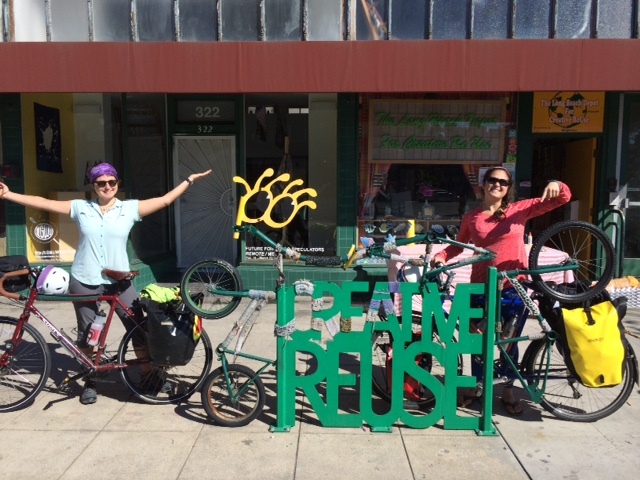 Follow our progress on Twitter @bikeperiod and Instagram @sustainablecycles ! Long Beach, CA: Monday 3/2 4-6pm at The Long Beach Depot for Creative Reuse, 320 Elm Ave.
2015 Indiegogo Campaign is up – Help us Spread the Word! Our March- June 2015 Tour is right around the corner and our Indiegogo campaign to raise $10,000 is in full swing! 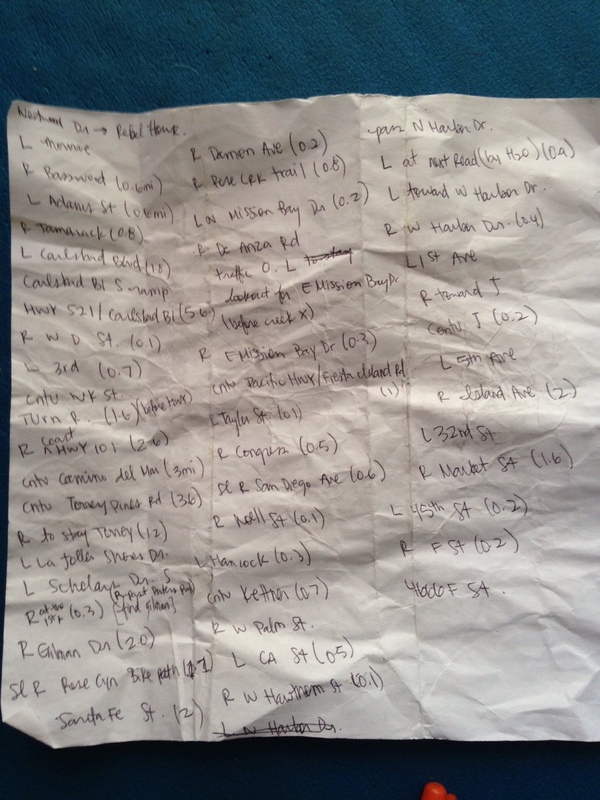 Read this post about the tour. Check out our Facebook event for the fundraiser and invite your friends. “Like” Sustainable Cycles on Facebook. Get in touch if you want to be involved! Sustainable Cycles is a collective of “spokeswomen” who travel across the country by bicycle to lead workshops about eco-friendly menstrual products.The project was started in 2011 by Sarah Konner and Toni Craige, who biked down the West Coast meeting with groups of women to discuss the cultural taboos of menstruation and pass around a show-and-tell kit of alternatives to single-use pads and tampons. The project gained momentum and a year later, Rachel Horn led a second bicycle tour, talking about periods and the environmental impact of the products we use everywhere she went. Now, SIX WOMEN from diverse backgrounds want to take the project to the next level! Rachel and Olive from Los Angeles, Ruby and Sarah from New York City, Rosie from Australia, and Kim from South Africa are going to bike from the West Coast to Boston. 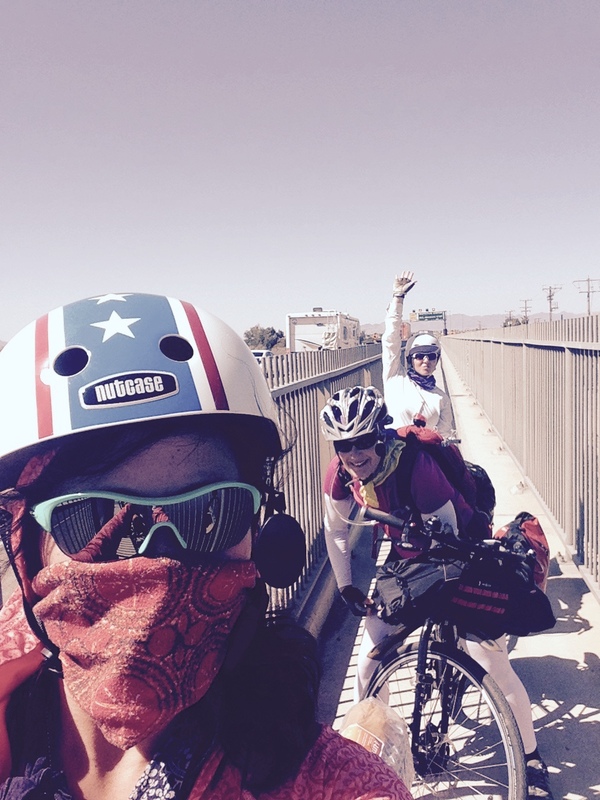 Our six riders will follow two separate routes (one southern and one midwestern) from California to converge in Richmond, VA. Then we will ride in one big group up the east coast to end at the Society of Menstrual Cycle Research’s National Conference in Boston, Massachusetts. We will present our project at the June 2015 event and network with others doing work in this field. SO FAR, MENSTRUAL CUP AND REUSABLE CLOTH PAD COMPANIES HAVE DONATED OVER 1,000 SAMPLES FOR US TO PROMOTE AND DISTRIBUTE ON OUR TRIP! OUR SPONSORS INCLUDE DIVA CUP, LUNETTE, MY OWN CUP, RUBY CUP, AND PARTY IN MY PANTS. During our three months on the road, we will host events in different cities along our routes and start person-to-person conversations with hundreds of women about menstrual health and alternative products. We will encourage them to switch to methods that are safer and more environmentally friendly, and spread the word to their friends and communities. Let’s break the cycle of shame and embarrassment around “cycling”! We want to raise $10,000 to help cover the cost of food, bicycle maintenance, emergency repairs, and transportation to and from our start and end locations. While we are doing our best to be frugal and source used and donated gear, there are still many items we don’t yet have that will be necessities on the road, especially since we will be riding through a variety of climates and terrain. 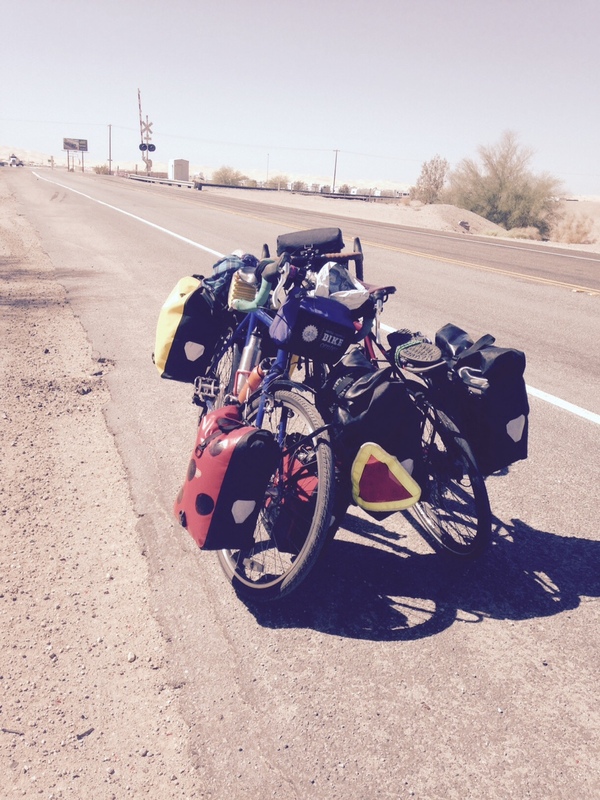 We will definitely need to replace things like tires, tubes, and brake pads as they wear out over the trip. We will also need to keep ourselves fed and watered. Remember, the money we raise will be distributed between six riders! If you aren’t able to contribute financially at this time, please check out our list below of other donations we will gladly accept! By donating to this campaign, you are supporting a cultural shift towards more environmental and health-conscious practices, as well as more open discourse surrounding women’s bodies and menstruation. We have done bike tours like this before, and we have been successful in spreading knowledge about alternative products and getting hundreds of women across the country to make the switch to reusables. We are already supported by many of the companies who manufacture these sustainable products, but we need YOUR SUPPORT to make our largest cross-country tour ever a reality! Besides the physical “stuff”, connections to potential hosts and communities who would be interested in workshops along our routes are invaluable! Know a women’s health center, bicycle coalition, social/environmental/student group, health food store, or other potentially interested party in any of the following cities or surrounding areas? Please reach out to us and let us know! Please share our campaign with your friends and pass the word along about our project! Even if you can’t contribute at this time, supporting our work by talking about it with others will help us greatly!